2018 was declared by Gartner to be the year that Desktop-as-a-Service (DaaS) solutions became the “defacto solution of choice” for business workspaces. DaaS technology is not new, just like the cloud revolution, but with the biggest operating system players getting on board (i.e., Microsoft) and saying good-bye to the desktop as we know it, it seems Gartner’s declaration wasn’t too far off the mark. Just this week, HTF Market Intelligence released a report declaring that the Desktop-as-a-Service market is expected to grow 49% CAGR. 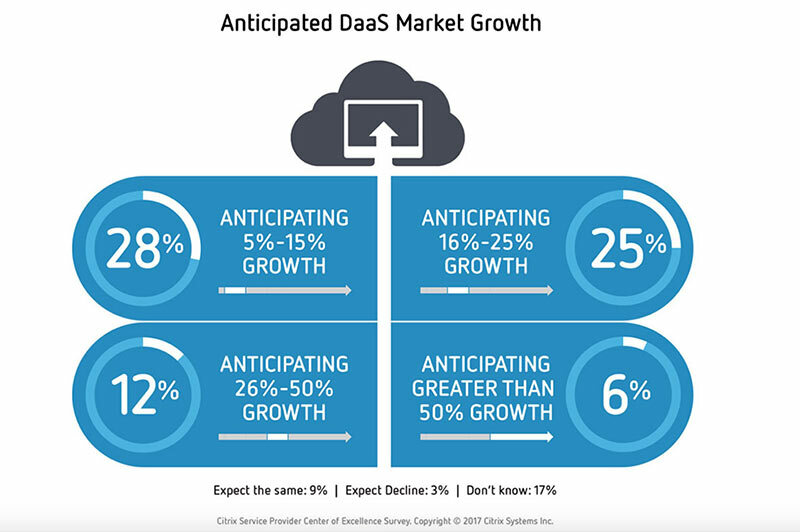 This seems to agree with Citrix’s assessment last year after surveying Citrix Service Providers, where 70% of providers anticipated increased revenues from a growing market. Additionally, Citrix found that the average size of their provider’s seat count has grown with over 16% of the market going to organizations with 500 seats or more. Gartner’s 2018 DaaS Survey shows even more growth with 75% of vendors surveyed indicated they had a customer with over 1000 seats. All of this goes to show that businesses are recognizing the value in Desktop-as-a-Service (DaaS) and are increasingly turning to the technology to meet fundamental needs. By its very definition, DaaS is radically changing the nature of work today. DaaS gives businesses and employees alike the freedom to choose. When, where, and how they work. Which devices they use, regardless of operating system or brand, are up to the organization. As long as they are able to access the internet and have a web browser, the desktop is accessible. Sick days, inaccessibility due to out of office travel or delays due to commuting no longer have the power to affect an employee’s productivity and the businesses bottom line. Control – provision, modify or de-provision desktops on the fly. Is an endpoint stolen? Change the access credentials in minutes and avoid potential theft of data and a task that is impossible with a standard desktop implementation. Attacked by a cybercriminal? No problem, as all data is stored centrally with multiple levels of security to keep your data safe. Your business is in full, instant control of every user and every device on your network. Agility – the current process for most network administrators is that when an update or new application is to be installed, IT needs to physically access every user’s device and manually trigger an install file. Or software updates. Instead of coordinating schedules between IT and users, IT just needs to update the cloud and the updates filter down to each user’s virtual desktop. Productivity – productivity gains are two-fold. Not only does IT spend less time working on routine maintenance and installs of devices, but employees spend less time without access to their workstation. If their workstation fails, all a user has to do is find another workstation and continue working. An impromptu meeting between departments? Instead of having to return for a users laptop, which holds the work product, the user just needs to log into their virtual workspace from whatever endpoint is accessible. Critical tasks can still get done, even if a worker finds themselves unexpectedly out of the office, whether due to their own or a family members sickness, commuting issues, natural or other disasters, they can still access their desktop and remain productive. The desktop and all of the data is stored in a secondary location, meaning all a user needs to do is find another web-enabled device and log in. Reduce CapEx – It sounds impossible, but it’s true. Virtual desktops and desktop-as-a-service enable businesses to significantly reduce capital expenses and even reduce operating expenses by as much as 50%. How? By extending the life of existing workstations (desktops, laptops, mobile devices, etc.) since the majority of the processing power is now on the cloud infrastructure, workstations can continue to be viable well past a typical lifecycle. Because of this, businesses can postpone large capital expenditures. dinCloud was recently listed in the Gartner Market Guide to Desktop-as-a-Service, being listed among such powerhouses as Citrix and proving that they are a major player in the cloud virtual desktop arena. dinCloud works to offer a secure, efficient experience with transparent pricing to ensure that there are no surprises in your cloud bill. DaaS is not just an overhyped and marketed technology. It has been declared by industry analyst firm, Gartner, as the ‘defacto workspace of choice’ and is a critical part of enabling businesses to transform digitally. We invite you to learn more about why you should embark on a journey to desktop-as-a-service in our whitepaper “Making a Case for DaaS” or speaking with one of our cloud specialists today.